Small Scale: Sheet: 23.8"x35.4", Design: 20.8"x31.5"
Large Scale: Sheet: 23.2"x34.4", Design: 20.2"x30.4"
Top edge stencil is included for FREE! Moroccan stencils are as popular as ever! Why use expensive wallpaper when you can simply stencil your walls with this trendy Moorish Delight Allover stencil! We love Moroccan designs and hope you do too. Reusable stencils save you lots of money and make you feel proud of your creation. Your friends are not going to believe you've stenciled this yourself! 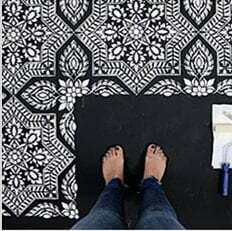 This trendy Moroccan wall pattern stencil is perfect for easy and fun DIY decor. This is an "outlining" stencil, meaning you're outlining the pattern as opposed to filling it. Keep this in mind when choosing your stenciling color: this will be the color of the pattern's outlines. Refer to Actual stencil picture (the last black and white picture) to see where the paint goes. Registration is built into design for ease of aligning. Our stencil patterns bring stylish elegance to any room. Great for traditional or contemporary decor - just play with your color combination! Looks stunning on the accent wall, for which it is recommended. This Moroccan stencil works for curtains, pillows and furniture embellishment as well. Stencil features an easy registration system, just use parts of the previously painted design to align the stencil, check for level and continue. This gives you a seamless "wallpaper" look. Don't worry about super perfect alignment: in the end your eye will never ever notice the discrepancy. We decorative pros "fudge" damasks and allover patterns all the time! The walls in most houses are often not straight, so some "fudging" while stenciling is very helpful and, in the end, not noticeable. Want to learn how to stencil an interlocking allover pattern? Easier than you think! Here are the detailed illustrated step-by-step Damask/Allover Stenciling Tips. We find that it is not necessary to use spray adhesive with our stencils, but for this crisp geometric pattern it is recommended. If you want to minimize paint seepage or are using high contrasting colors, adhesive is very helpful (Elmer's spray adhesive seems to be the best). Make sure you shake the can well and lightly mist (not drench) the stencil, and let it dry for a moment before positioning it on the wall. This step will prevent the adhesive residue transferring to the wall. You'll need to re-mist the stencil after a few repeats. Clean-up tip: Spray the stencil with Simple Green to help to remove adhesive residue. Did you know you can stencil on fabric too? You can create custom stenciled curtains, pillows and table cloths with our stencils! When stenciling on fabric, stencil adhesive is very helpful. First, tape your ironed fabric to the surface so it doesn't move around while you stencil. Use stencil brushes, or roller, and add some textile medium (sold in craft stores) to your acrylic paint. You can also get a special fabric paint, but, frankly, good craft acrylics with a dollop of textile medium work just as well, and costs way less too! :) Let the stenciled image dry completely, 24 hours is best, then heat-set it by ironing the fabric for about 20 seconds (more or less) on a LOW setting through the piece of cloth. Heat-setting will cure the paint and prevent it from being washed off in the washing machine. Always experiment with a sample of your fabric first to ensure good results. I've stenciled on silk, cotton, linen and even sheer fabrics with great results. It's always better if your fabric doesn't have too much texture. The stencil is made out of durable 12 mil clear plastic stencil material. This material is strong but flexible, reusable and easy to clean. We love it so much more than standard 5-8 mil Mylar! It's not brittle, user friendly and just so easy to work with. In our many years of professional stenciling this material has proven to be far superior to any other stencil material we used. Our customers love it too, and we are sure that you'll notice the difference! Our stencils will last a long time and are a pleasure to use. *Images are for reference only, please check the actual size and scale of the stencil design.